Though things often seem nonchalant and haphazard here, it’s interesting how carefully calculated things actually are. 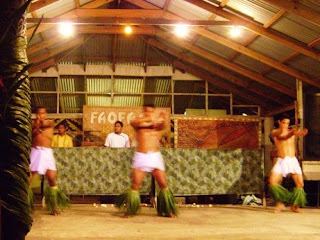 When we first arrived in Samoa, we did not go straight to the host village; instead we lived in a hotel for 10 days. We were eased into the country in air-conditioned rooms, and if that wasn’t posh enough, we spent a day at the beach and a day on a chartered snorkeling excursion before we left for the host village. Though it was never overtly communicated to us, I felt it was a subtle reminder that we’ve been assigned to a beautiful place and there’s no way we can complain about the host village when we’d just spent 2 days playing in the ocean. This weekend was much in that same vain. After spending 5 months at our job sites, group 81 came back together to spend 4 days and 3 nights on a gorgeous beach on the southern coast of Upolu. In addition to High Intensity Language Training, we also had lots of time devoted to sharing our experiences and venting our grievances. We arrived for lunch on Monday, and after spending an hour talking about the difficulties and frustrations of our jobs, a bunch of us went swimming… and then it clicked. Allotting lots of time for airing grievances and holding the event in a serene, idyllic venue was no coincidence at all. WE had been brought here to unwind and rejuvenate ourselves. And it seemed to work pretty well. Truth be told, I never viewed this week as a conference or a work retreat. 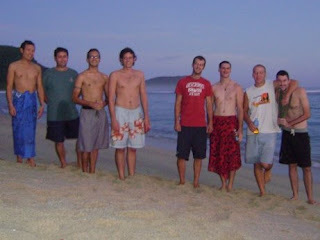 In my mind, this week was a free vacation on the beach with the old crew from training. And going into it, I was surprised to find others dreading the week./ But I think most of the group warmed to the beach and the tasty (free) food and the lax atmosphere pretty quickly. The work-related sessions were a lot easier to digest than similar sessions we had during training because we now have a much better idea of our jobs and the challenges we face daily. And it was good to get a pulse check from everybody. The language sessions were also easier to handle after spending 5 months in varying levels of language immersion. It was easier to separate the skippable from the inimitable, and we all came in with specific questions regarding how to say certain things or the proper way to address situations we often face. In fact, I think my favourite session of the week was the one entitled, “ Open Forum: Language and Culture questions.” It gave us the chance to voice areas of confusion (e.g. How do I decline a dinner invitation? How do I avoid being ripped off at the market? How much money do I give when I attend a funeral? ), but more than that, it gave us the chance to embrace the thrill and difficulty and inherent humility involved in living and working in a foreign culture. It was the kind of deal where in the middle of the conversation it dawned on me how cool and rare such a conversation is; particularly in such a formal setting and with so many voices in the mix. And then there was down time. Since there are no beaches in Apia and few opportunities to swim in the ocean, I took advantage of being near the sea at nearly every opportunity I got. 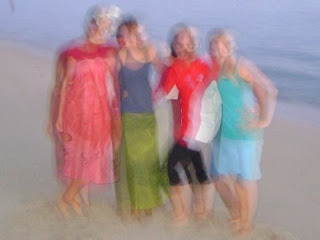 But when we weren’t dodging coral together, we were huddled in conversations over tea, telling jokes and gossiping, as Peace Corps are wont to do. The whole environment was so lax I didn’t wear a shirt from just after lunch on Monday until I finally put on one just after lunch this afternoon. I don’t know if I’ve ever logged 72 contiguous hours of shirtlessness in my life, but this week it was a testament to shedding stressors, baring our flaws, and soaking up the sun. Not a bad week. I hope you missed me this week as much as I missed you. Pictures below. 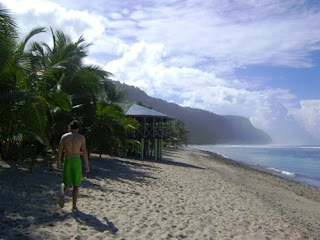 The beach where we stayed. Group 81 guys (minus Joey, who missed the conference because he was working on a project on Savai'i). Left to right (shortest to tallest): Supy, Koa, Me, Paul, Jordan, AJ, Dan, Phil. Group 81 girls... Sorry the picture didn't come out well at all. Left to right: Kate, Chris, Blakey, Erin. Breakfast on Tuesday(? 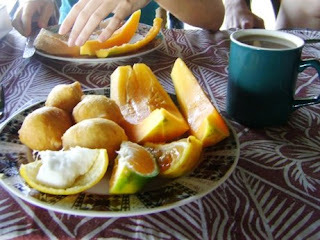 ): Panakeke, papaya, oranges, and tea. 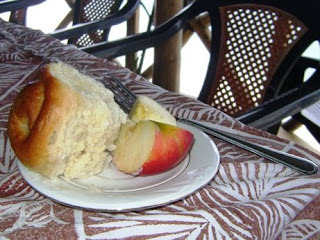 Afternoon snack on Wednesday: Panepopo (sweet bread served in an inch of coconut cream) and apple wedges. 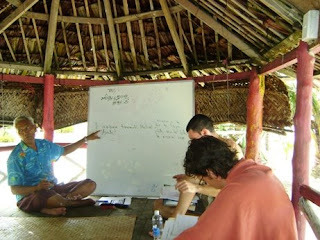 Language class in Onofia's fale. Another culture show on Wednesday night. 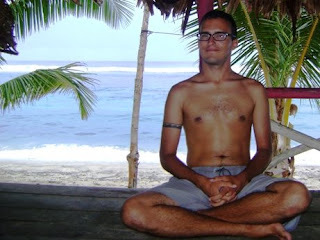 It think it's my 78th since arriving in Samoa. Yay how cool to have you back on again. Envious of your work retreat as Fafao definitely looks good. Hope you're enjoying NZ. I'll trade you for first week back at work. "shedding stressors, baring our flaws,"...that's some GREAT stuff!! You're documenting a lot of great "life lessons" for us all to be learning from. Good on you for fully enjoying such a wonderful retreat!! The food pics of my fav. 's...panekeke and panepopo (sp?) are making me drooooool!!! LOVE them!! Wish I could make them! I'm getting excited to read about your NZ adventures and am hoping I recognize some places!